I went ahead and broke this down into its own post due to how long of a process it was. This sourdough Calzone Skin recipe is based off of the Pizza skin recipe from "The Cheese Board Collective Works" and is the sourdough used by Arizmendi Bakery for their bread and pizza. Put 3 cups of flour into the bowl of a stand mixer and add the water. Turn mixer to low using your paddle attachment and let mix for 3 minutes or until ingredients are thoroughly combined. 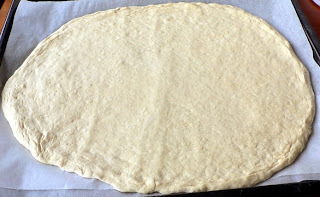 Transfer dough to a lightly floured flat surface and knead by hand for about 5 minutes adding flour as needed until dough is smooth, shinny and passes the windowpane test. Put 3 cups of flour into a large bowl and add water. Mix with wooden spoon until the ingredients are thoroughly combined. Let rest for 10 minutes, then add the salt and starter and mix until all ingredients are thoroughly combined. Transfer dough to flat lightly floured surface and knead for 15 minutes by hand adding flour when necessary to keep it from sticking. Knead until smooth, shinny and passes the windowpane test. Form dough into a ball and place it in a large olive oiled steel bowl. Turn dough in bowl and coat completely with oil. Cover the bowl with plastic wrap or a damp kitchen towel and let rise overnight in the refrigerator. 2-3 hours before using dough remove from refrigerator and let sit out. Separate dough into three equal portions and roll out into three thin crust calzone skins to make some great calzones!